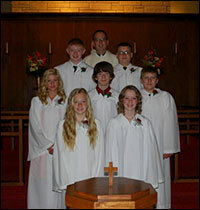 Confirmation at Zion is a two year program which begins in seventh grade. During these two years, our confirmands learn the basics of the Christian faith as taught in Holy Scripture and Luther’s Small Catechism. Specific emphasis is given to the Old and New Testament, the Ten Commandments, the Apostle’s Creed, the Lord’s Prayer, Baptism, Holy Communion, Confession and Absolution, and what it means to be Lutheran. Confirmation classes are offered on Wednesday Evenings from 6:30 pm until 8:00 pm.